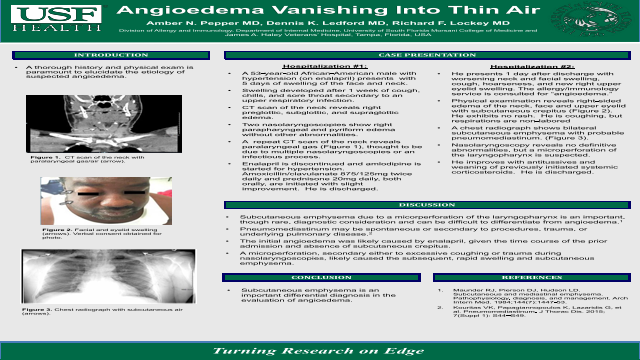 Abstract: Introduction: A thorough history and physical exam is paramount to elucidate the etiology of angioedema. Methods: A 53-year-old African-American male with hypertension presents 1 day after discharge from a prior hospitalization for suspected enalapril-induced angioedema with worsening neck and facial swelling, cough, hoarseness, and right upper eyelid swelling. Physical examination reveals right-sided edema of the neck, face and upper eyelid with subcutaneous crepitus. He exhibits no rash. He is coughing, but respirations are non-labored. A chest radiograph shows bilateral subcutaneous emphysema (air) with probable pneumomediastinum. Nasolaryngoscopy reveals no definitive abnormalities, but a microperforation of the laryngopharynx is suspected. He improves with antitussives and weaning of previously initiated systemic corticosteroids. He was previously hospitalized for 5 days for swelling which developed after 1 week of cough, chills, and sore throat secondary to an upper respiratory infection. During this prior hospitalization, enalapril was discontinued and systemic corticosteroids and antibiotics were prescribed with slight improvement. Two nasolaryngoscopies showed right parapharyngeal and pyriform edema, and a computerized tomography (CT) scan of the neck revealed right preglottic, subglottic, and supraglottic edema. Results: Subcutaneous emphysema due to a micorperforation of the laryngopharynx is an important, though rare, diagnostic consideration and can be difficult to differentiate from angioedema. The initial angioedema was likely caused by enalapril, given the time course of the prior admission and absence of subcutaneous crepitus. A microperforation, secondary either to excessive coughing or trauma during nasolaryngoscopies, likely caused the subsequent, rapid swelling and subcutaneous emphysema. Conclusion: Subcutaneous emphysema is an important differential diagnosis in the evaluation of angioedema. Summary: A thorough history and physical exam is paramount to elucidate the etiology of angioedema.References: 1. Maunder RJ, Pierson DJ, Hudson LD. Subcutaneous and mediastinal emphysema. Pathophysiology, diagnosis, and management. Arch Intern Med. 1984;144(7):1447-53.